At Cavallino Bianco Hotel & Suite , elegant 3-star hotel in Mediterranean style, centrally located in Riccione, with parking, WI-FI, garden, disabled facilities. Small pets are allowed. 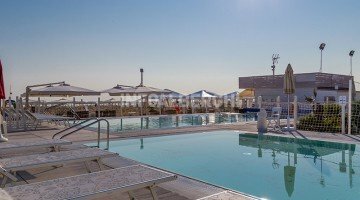 The hotel is located in Riccione in Viale Dante, next to the Riccione dock, near the beach, the Palacongressi and Viale Ceccarini. All rooms are equipped with independent air conditioning, chromotherapy showers, 26 '' LCD TV, DVD player, desk, WI-FI, minibar, balcony, electronic safe, courtesy set with bathrobe and slippers. DREAM: balcony overlooking Viale Dante or the garden, Jacuzzi in the living area, aromatherapy, emotional shower with chromotherapy in the bathroom. WELLNESS SUITE: balcony overlooking the garden, multi-function hydromassage tub, shower with chromatic light source and mini-kitchen with electric burners, microwave, dishwasher. PRINCESS JUNIOR SUITE: romantic style, balcony overlooking the dock or Viale Dante, bathroom with hydromassage shower and chromotherapy, glass sink. DELUXE: total white, modern design and attention to detail, large bathroom with emotional shower. FAMILY: interconnecting rooms with a hydromassage bath, mini-kitchen, multi-function hydrotherapy tub and chromotherapy shower are available. Hanging garden with large Jacuzzi, open-air porch, sun terrace, Jacuzzi, reading room, small conference room, newspapers, outdoor laundry. Weekly theme nights with live music. Aperitifs on the open-air porch every Sunday. PARKING: covered, fenced, by reservation and paid in summer, free in winter. SERVICES FOR DISABLED: entrance on the ground floor, lift for disabled people, accessible common areas, room with wheelchair maneuvering space, bathroom with accessible shower and special chair. BREAKFAST: sweet and savory buffet, pies, cakes, cereals, biscuits, fruit juices, yogurt, jams, fresh fruit, cheeses, cold cuts, hot drinks at the table, selection of gluten-free products. LUNCH AND DINNER: 3 choice menu of meat and fish and vegetarian, buffet of appetizers. VARIATIONS: menus for coeliacs and special diets on request. In hotel: strollers, bicycle seats, baby / mini club, summer baby sitter, outdoor playground area, indoor playground area, pediatrician. In the room: beds with rails, cots, baby baths. At meals: high chairs, table seats, flexible hours for lunches and dinners, baby menu, baby food, baby cutlery, bottle warmer. On the beach: children's pool, entertainment, cabaret, playground. Outdoor relaxation area, on the first floor, surrounded by the green roof garden, with a large Jacuzzi. 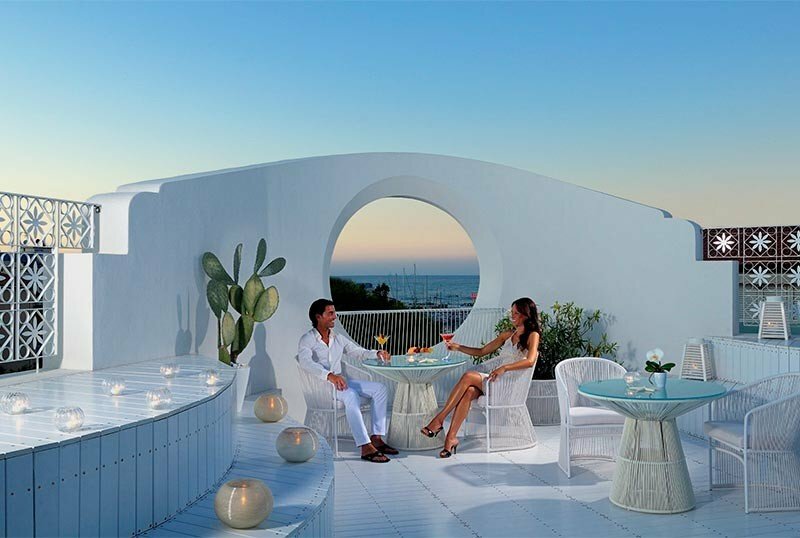 Panoramic sea view terrace, on the fourth floor, with sunbathing area, sunbeds, open air shower. The hotel has an agreement with the beach resort Spiaggia del Sole n. 86/87, equipped with 2 swimming pools, hot showers, 5 playgrounds, mini club, nursery, ping pong table, small basketball court. All Inclusive Packages min. 7 days min. 2 people. TOURIST TAX: not included. € 1.80 per day per person starting from 14 years for a maximum of 7 consecutive days. ALL INCLUSIVE: Full board + Drinks with meals (1/2 liter of mineral water + 1/4 liter of local wine or small beer or soft drink per adult person and meal) + Beach service at the partner beach with umbrella, cot, mini- club, playground, 2 swimming pools, one for adults and one for children. In some periods of the year children stay completely free! All Inclusive: + € 15.00 per person and per day. FREE children up to 12 years if sharing a room with two adults. Children up to 4 years are FREE if in a room with two adults. 2 children up to 13 years free in room with 2 adults! Offer valid also for New Year's Eve. The beach, the trendy clubs on the beach and in Viale Ceccarini, the opportunity to practice any sport, the famous food and wine tradition, relaxation and wellness, the fantastic theme parks, the beautiful medieval villages ..
All of this is Riccione, so do not wait: book by 28/02/2019 and your June holidays will be cheaper! Traveling as a couple you will get a 15% discount on our list prices. There is a special offer dedicated to mothers, grandparents, single parents with children! - One adult and one child up to 13 years € 120.00 per day. - One adult and two children up to 13 years € 135.00 per day. - 2 grandparents € 120.00 per day. The 2nd or 3rd child of 0/3 years is our guest! We are waiting for you to spend 3 wonderful days by the sea! The offer includes a sweet and savory buffet breakfast served until 12.00 with lots of Easter eggs! 2 children up to 13 years free in room with 2 adults.